Browned Butter Toffee Chocolate Chip Cookies are loaded with huge flavor and soft yet chewy, ooey gooey texture. These were a HUGE hit! Taste: Possibly the most flavorful chocolate chip cookies I’ve ever tasted. The combination of the nutty brown butter, the rich sweetness of the dark brown sugar, and the caramel-y toffee is INSANELY good. Texture: These cookies are big, thick, chewy, ooey, and gooey. Seriously perfect. Ease: More involved than your standard chocolate chip cookie recipe. There’s the browning of the butter and letting the dough chill for at least 24 hours. This is not an instant gratification cookie recipe unless you’ve got a stockpile of dough balls in the freezer that you can bake off at anytime like I do. Pros: Fantastic chocolate chip cookies that your family and friends will adore. Cons: A little extra work involved, but I promise it’s completely worthwhile. Would I make this again? Oh yes. Once my freezer stockpile runs out I plan on keeping a steady supply of these cookies coming out of my kitchen. Have I got a cookie recipe for you today!! I know you guys love cookie recipes, so sometimes I just sit around dreaming up new ways to improve the chocolate chip cookie. If you’ve seen my Ultimate Guide to Chocolate Chip Cookies series, that’s probably not surprising behavior. This Browned Butter Toffee Chocolate Chip Cookie recipe is kind of a mouthful to say, but when you actually have a mouthful of one of these cookies I think you’re going to love me. 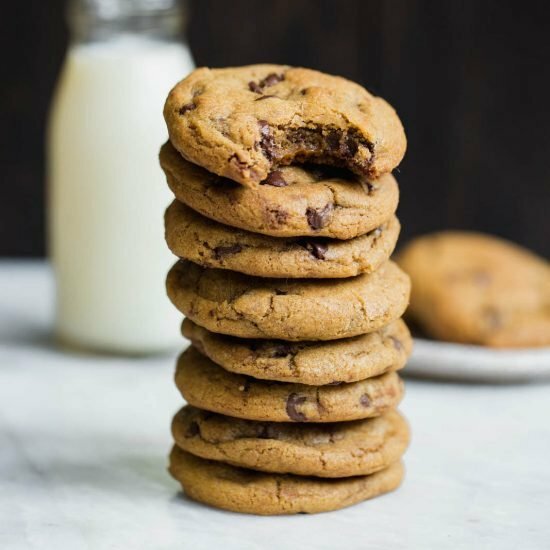 These are one of the most flavorful chocolate chip cookies I’ve ever tasted, and the texture is absolutely perfect. You NEED to try this recipe. If your friends and family are anything like mine, they will thank you and ask for the recipe! This recipe was carefully written to create ultra flavorful cookies with a super thick, chewy, and gooey texture. The egg yolk, bread flour, and extra dose of brown sugar all help create that perfect chewy texture. You can use only all-purpose flour if you must, but it won’t be as good. 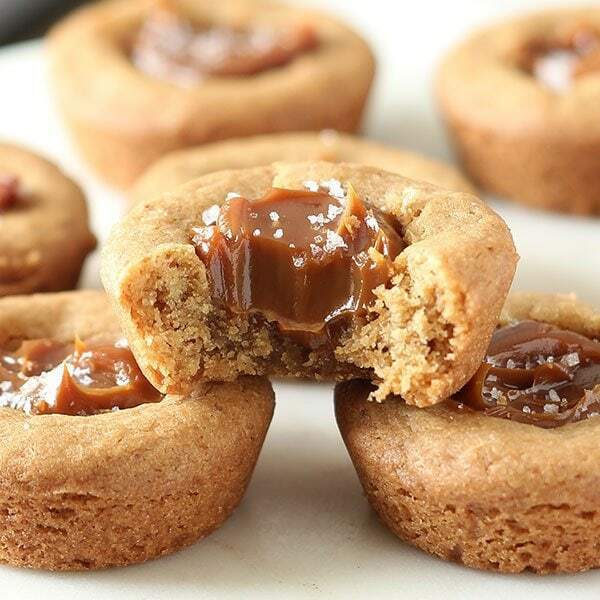 Also, this recipe calls for DARK brown sugar which helps amplify that butterscotch flavor. Again, you can use light brown sugar but it won’t be quite as awesome. There is a 24 hour chilling period in the refrigerator which further improves the flavor and texture. If you can’t wait that long, chill at least until slightly firmed since the browned butter will make the dough a little too loose and warm to go into the oven immediately. Lastly, these are big cookies which is just the way I like them. I use my favorite OXO 3-tablespoon cookie scoop, but feel free to scoop smaller portions of dough for smaller cookies, just shave about 2 minutes or so off the baking time. Of course, the dough can be frozen for these cookies. For tips on how to freeze cookie dough, click here. Visit my Chocolate Chip Cookie headquarters for more recipes, tips, and insights into the science of cookie baking! In a small saucepan set over medium heat, melt the butter. Swirling the pan occasionally, continue to cook the butter. It should become foamy with audible cracking and popping noises. Once the crackling stops, continue to swirl the pan until the butter develops a nutty aroma and brown bits start to form at the bottom. Once the bits are amber in color, about 2 to 3 minutes after the popping stops, remove from heat and pour into a mixing bowl. Allow to cool for about 20 minutes to room temperature. With an electric mixer, beat the cooled butter, granulated sugar, and brown sugar until well combined, about 1 to 2 minutes. Add the eggs, yolk, and vanilla, beating until combined. On low speed, gradually beat in the flour mixture. Stir in the chocolate chips and toffee bits. Wrap dough in plastic wrap and refrigerate for at least 24 hours but no more than 72 hours. Preheat the oven to 350ºF. Line baking sheets with nonstick baking mats or parchment paper. Let dough sit at room temperature just until it is soft enough to scoop. Divide the dough into 3-tablespoon sized balls and drop onto prepared baking sheets. At this point you can freeze the dough balls until hard then transfer to an airtight container and store in the freezer for up to 2 months. Let sit at room temperature for 15 minutes before baking as directed. Bake for 12-15 minutes, or until golden brown. Remove from oven and let cool for 2 minutes before removing to wire racks to cool completely. 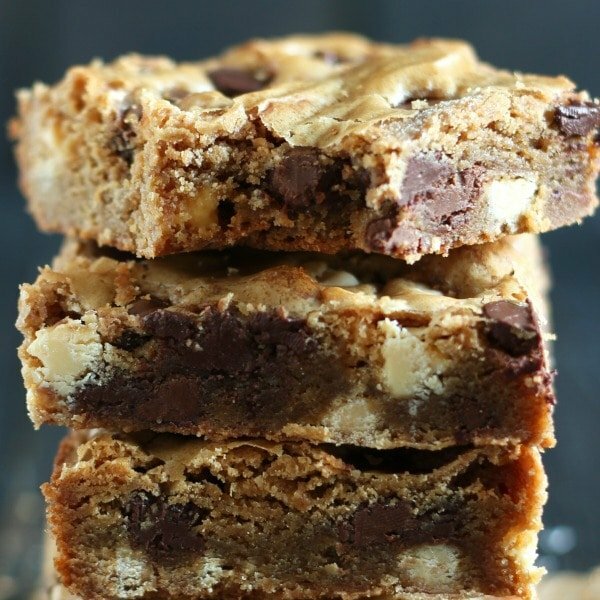 You had me at browned butter….then you said toffee and chocolate chip cookies and my taste buds fell off my head. These look PERFECT Tess! Pinned! These cookies look amazing! I love toffee flavor as well as really soft, chewy chocolate chip cookies with crisp edges. I will definitely plan on making these soon. One question, would making these cookies smaller interfere with the overall texture of these cookies? Typically, I haven’t had an issue with this as long as I decrease the baking time, but just wanted to be sure since that texture looks like one of the best parts about these cookies! I also appreciate your detailed instructions on how to brown the butter, including the cooling time! Other recipes I’ve noticed just say to brown the butter and that’s it. Also, I love your chocolate chip cookie guide! I’ve always wanted to do that but never had enough people to consume all those cookies! Your results are really interesting though and helpful! I need about a dozen of these just for me! I need these cookies in my life…chocolate chip with toffee…wow! Thanks for sharing! yum! these look divine.. love brown butter cookies. Hi! i was wondering if i could use margarine in place of the butter?! These really do look amazing! Unfortunately you cannot use margarine – it needs to be butter! I wanted to know if I can substitute all-purpose flour in place of bread flour. I realize, from your Ultimate Guide to CCC, that bread flour makes cookies thick and chewy, but would the cookies still be near perfect if I use only all-purpose flour? They definitely won’t be as thick and chewy with AP flour but you’ll still get nice cookies. Hi, these cookies look amazing. I am plannimg to try these soon. Could I substitute the AP flour and bread flour for 100% whole wheat flour? You could, though I would recommend using white whole wheat flour instead for a more delicate wheat taste and texture. We don’t get toffee bits around here, but we do get regular chocolate bars with toffee bits inside, so I was wondering if I could chop up these bars to resemble chocolate chips and use them in place of the toffee bits and chocolate chips. You can use whatever kind of chips or chocolate you want! Wow! These look like cookie perfection! When you use your frozen cookie dough do you let it thaw out first before baking? I usually just take the dough out then preheat the oven. The colder the dough is the thicker the cookies will be. I made these cookies over the weekend and the flavor was outstanding! The only thing was that they baked up completely flat. I chilled them the 24 hours and even popped a batch into the freezer on the cookie sheet right before baking, the way I do with my sugar cookies. Same results. I really want them to look like YOUR cookies pictured above. These really are the best in flavor. So I’m wondering…. Could I put the browned butter in the fridge until it got hard again? I’ve never tried to solidify browned butter. What do you think? What kind of baking sheet did you use? Did you grease the sheet at all? I used a doughmakers sheet (regular large sheet with no sides and it is NOT non-stick). No grease at all and I used parchment paper for most batches and my silpat for one batch (those were too dark on the bottom). Do you prefer these or your ultimate chocolate chip cookies? Why? I have tried the ultimate chocolate chip cookies and they were excellent. I am just wondering if I should try these cookies or stick with the ultimate chocolate chip cookies. I like these cookies when I want to switch things up a bit – they are more flavorful than the Ultimate Chocolate Chip Cookies. Try them out – you’ll like them!! Could I freeze this cookie dough and just take out what I need whenever I feel like a cookie? I’m getting ready to make these right now, but as I read through the directions I’m just a little confused. The directions state that at this point you can freeze the balls, then it continues with the directions to let them sit for 15 minutes at room temperature before baking. Is this applying to the freshly made dough or the frozen or both? The freshly made dough would already be close to room temperature – that line is meant for frozen dough balls. Do you have to form the individual cookie balls before freezing? I have a small freezer and would prefer to freeze the whole plastic wrapped dough together as it takes up less space than a large plastic container. Then thaw and shape for later use. Will this change the texture and final bake result? These taste really really good! The only hard part is letting them sit in the fridge for a day. So I made 5 and ate them all in about 20 seconds, then put the rest of the dough in the fridge. How would sifting the dry ingredients affect the recipe? I know some recipes require that to be done. I hope to make these soon! Thanks! Hello, I was wondering what I have to do to the recipe if I wanted to add oatmeal into the mix? Delicious. I just made these (but only had all purpose flour), the chai tea sugar cookies, and your oatmeal cookie (I love raisins so used that instead of chocolate). Every single recipe turned out beautifully. Thank you for posting these recipes. This is my first time visiting your site, and I love it! I have a question for you though, do you have any chocolate chip cookie recipes that can help me use up my bag of Rolos? Need oC the F word disappeared in the 70’s which was last century. Sticks and cups I can live with. Celsius or Centigrade is modern please use alongside the vintage F word. Hi, can you help me with substitution from dark and white sugar to raw honey only. Thank you. Hi Lana, unfortunately that won’t work. This recipe is best made as written! when browning butter, do u use those brown bits that are formed during cooking? I have always strained those out but that does loose a lot of butter. Please help me on this. BTW, you are causing me to loose a lot of time during the day cause all I want to do is read everything you write, often more than once, and I’m not getting the laundry, dusting, and vacuuming done! lol. jk. Then the rest of the day, I’m baking according to your tips and recipes! And I wouldn’t have it any other way. 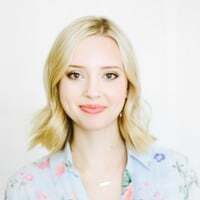 Obsessed with your blog! Do you sift your flour for cookies or do you find that it makes a difference? Nope, I don’t find it’s worth the hassle! Made the cookie dough during the week to bring up to Lake Tahoe for a snow trip this weekend and everyone loved it! Amazing flavor and warmed us up with a glass of milk! Not to mention the whole house smelled heavenly! I used a mix of semisweet and milk chocolate chips, perfect combination! This is one perfect cookie. I’ve chilled the dough for about 4 hours and still they turned out amazing. Rich flavour, caramel aroma, wonderful texture. I’ll definitely keep a supply of them in my freezer. Can these be made even larger or will they spread too much? Just made my third batch of these! Everyone that has tried these cookies RAVES about how delicious they are. Thanks for the tips and tricks your provide throughout the recipe. It was clearly written and easy to follow. Can the recipe be halved? Hi! I started a chocolate cake, but my butter was too cold (cold kitchen). It wouldn’t fluff even after I added eggs & brown sugar. So I adapted recipe and made these cookies. I browned the second stick of butter, added a scant tablespoon of espresso powder. There was 1/2 cup extra brown sugar already in the mix so my final cookie sample (I couldn’t wait 24 hour!) was extra crispy. Also added a pecan half on top. Oh! So good!! I plan to bake off rest today & will shave off 2 minutes cooking time for another trial run to keep more moisture in the middle. I have some grandchildren coming to judge. Sure to be fun! I knew the dough was “off” because it was so dry and crumbly. The ratio of flour is too high. The baking powder is also unneeded. These cookies barely stayed together (and yes, I measured all ingredients precisely and double checked the amounts. I had to work a good amount of moisture into the rest of the dough to salve the batch. I’m going to try another recipe for this cookie.